Artist's concept of the extremely hot, carbon-rich exoplanet WASP-12b and its host star. A huge, ultra-hot alien planet boastssurprising amounts ofcarbon, a new study reveals, suggesting that worlds beyond our ownsolarsystem may be far more diverse than scientists had imagined. Researchers determined that largequantities of carbon swirlabout in the atmosphere of the gas giant planet WASP-12b, making it thefirstcarbon-rich world ever discovered. "This study shows that there is thisextreme diversityout there," study lead author Nikku Madhusudhan, now of PrincetonUniversity, told SPACE.com. "Fifteen years or so since the discovery ofthe first exoplanet, we're just beginning to appreciate how differentthey canbe." WASP-12b, discovered in 2008, isabout 1,200 light-yearsaway, in the constellation Auriga. The alienplanet is about 1.4 times as massive as Jupiter and sits just2 percent asfar from its parent star as the Earth is from the sun. 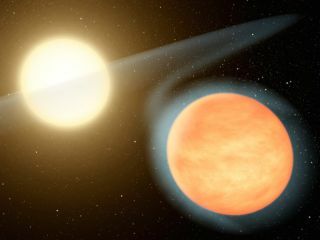 As a result of this extremely tightorbit, WASP-12b is asearingly hot world, with dayside temperatures reaching 4,200 degreesFahrenheit (2,316 degrees Celsius) ? hot enough to melt steel. Madhusudhan and his colleaguesanalyzed light thrown off byWASP-12b at several different wavelengths, using new observations madebyNASA's SpitzerSpace Telescope as well as older data from theCanada-France-HawaiiTelescope in Hawaii. By plugging this information into acomputer model Madhusudhandeveloped, they were able to determine the most likely composition ofthe alienplanet's atmosphere in great detail, and with a high degreeof confidence. "There is no room for significantuncertainty,"said Madhusudhan, who performed the research while at MIT. "This modeldoes not assume anything. It just runs through a huge parameter space." "Carbon richness" is a measure of howmuch carbona star or planet has, compared to its abundances of oxygen. Thecarbon-to-oxygen ratio of our sun is about 1-to-2, which means it hasabouttwice as much oxygen as carbon. No planets in our solar system areknown to have more carbonthan oxygen ? though the ratio is unknown for Jupiter, Saturn, UranusandNeptune, because water, the main oxygen carrier, is buried deep insidetheiratmospheres. But WASP-12b has significantly morecarbon than oxygen. Itharbors less water vapor and much more carbon-containing methane thanexpected,researchers said. The team reports its findings onlineDec. 8 in the journalNature. Because WASP-12b seems to be made ofdifferent stuff thanplanets in our own solar system, astronomers should open their mindswhenthinking about other alien planets, researchers said. "This study shows for the first timethat exoplanetscan be very different," Madhusudhan said. For example, small, rocky,carbon-rich planets could haverocks made of graphite or diamonds rather than the silica-based stuffwe'reused to here on Earth. "This changes the landscapecompletely,"Madhusudhan said. "It's nothing like we've ever imagined." The study also suggests that thebasic building blocks ofplanets can be diverse. The icy chunks of matter that came together to formthe planets in our solar system, for example, likely bearlittleresemblance to the pieces that built WASP-12b. "They could be made of tar, forexample,"Madhusudhan said. "That could be one explanation." The new results also bear on thesearch for life beyondEarth, he added. If alien planets can be so different, scientists mayhave toopen their minds to the varied forms life might be able to take. "What is the chemistry, and what sortof life-forms cansustain this chemistry?" Madhusudhan said. "This really opens ourperspective."